Canada’s men’s, women’s and mixed doubles teams were flawless in the opening day of competition at the Curling World Cup in Suzhou, China. The three Canadian teams all secured their first round-robin victories in closely contested games. Rachel Homan and her squad from Ottawa opened up the day for Canada. Homan took on Russia’s Anna Sidorova in a rematch of the 2017 world championship final. Just like in 2017 Homan once again prevailed. Homan was trailing by one in the final end and secured the victory in the final end with a tapback for two and 6-5 victory. But Homan, vice-skip Emma Miskew, second Joanne Courtney and lead Lisa Weagle didn’t have the most ideal start at the Suzhou Sports Centre. Canada started with the hammer in the first end, but were unable to stick a double that would have resulted in a score of two or three. Instead Sidorova stole one point to take an early lead and tacked on another steal of one in the second end. Canada battled back to tie the game by the fourth-end break by scoring one in the third and stealing a point in the fourth. Russia scored one in the fifth, but Canada countered with two points in the sixth, taking its first lead of the game. Russia reacted by scoring two in the seventh, but Homan secured the two points needed in the eighth with a tapback for the 6-5 win. Team Homan reunited with coach Marcel Rocque at the Curling World Cup. The four-time national men’s and three-time world men’s curling champion gained notoriety playing lead for the iconic Randy Ferbey team. He coached Homan’s team prior to a coaching stint in China and has committed to Homan’s team for the 2018-19 season. The Canadian women’s team returns to the ice tomorrow with one game against Minji Kim of South Korea (0-1) in the afternoon. The mixed doubles team of Laura Walker (formerly Crocker) and Kirk Muyres continued Canada’s winning ways in the afternoon draw at the Curling World Cup. The 2018 world bronze-medallist team opened the scoring against Norway’s Kristin Moen Skaslien/Sander Olav Rølvåg with a tapback for three in the first end. Walker/Muyres maintained the lead for the entire game en route to a 9-5 victory but couldn’t completely put Norway in the rear-view mirror. Norway scored one in the second end to trail 3-1. After this, teams exchanged deuces for the rest of the game until the eighth end when Canada ran Norway out of rocks to secure the victory. Walker and Muyres have a busy day Thursday with two games on the schedule. They’ll open the morning draw against Russia’s Maria Komarova/Daniil Goriachev (0-1) and then complete the first half of their double round robin against Therese Vestman and Robin Ahlberg of Sweden (1-0) later that afternoon. “It was a victory, but it was a grind out there,” said Muyres. “Conditions were tougher than we’re used to, but we said to each other be happy with being good, not great, and that worked for us. 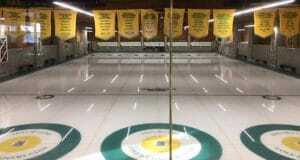 Kevin Koe (Calgary) and his new lineup featuring vice-skip B.J. Neufeld, second Colton Flasch, lead Ben Hebert and coach John Dunn made their debut against Switzerland’s Peter de Cruz. 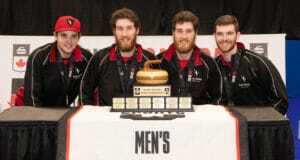 While both teams started cautiously, a key three-ender in the sixth helped secure Canada’s 6-4 victory. Canada took a 3-2 lead heading into the fourth end break but Switzerland evened the score in the fifth with a single point. 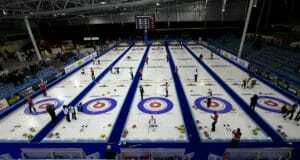 Canada broke open the game in the sixth end. Switzerland rolled too far on a double attempt which left Koe with a wide open draw for three. Koe only needed to bite to eight-foot to score, but he honed in on the button and covered the pin for a 6-3 lead. Switzerland attempted to score of multiple points in the seventh, but needed to opt for a blank. Switzerland tried setting up an end for three points but could only manage one, providing Koe with a 6-4 victory in his new team’s debut game. Canada aims to build momentum Thursday by completing the first half of the double round robin. The Canadians open with a game against Bruce Mouat of Scotland (1-0) and close the day out against Japan’s Masaki Iwai (0-1).